BarnOwl is a curses-based IM client forked from the ​ktools owl project. BarnOwl currently supports Zephyr, AIM, Jabber, IRC, and Twitter and aims to be easily extensible and customizable through a Perl plugin interface. February 28, 2017: BarnOwl 1.10 released. Download it here, or read the release notes or ChangeLog. December 02, 2013: BarnOwl 1.9 released. Download it here, or read the release notes or ChangeLog. March 14, 2012: BarnOwl 1.8.1 released. Download it here, or read the release notes or ChangeLog. 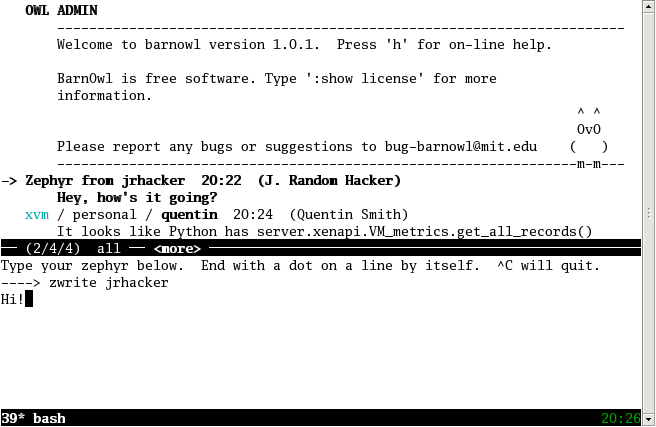 October 11, 2011: BarnOwl 1.8 released. Download it here, or read the release notes or ChangeLog. February 06, 2011: BarnOwl 1.7.1 released. Download it here, or read the release notes or ChangeLog. January 20, 2011: BarnOwl 1.7 released. Download it here, or read the release notes or ChangeLog. See OldNews for old announcements. Looking for ideas for what to work on or want to suggest a feature? Check out the bugtracker or our ​UserVoice forum. Snappy answers to stupid questions: a UserFAQ created in penance for asking an unnecessary question on zephyr. barnowl.png​ (35.4 KB) - added by geofft@MIT.EDU 11 years ago. Screenshot of mostly standard BarnOwl.